The menu consists of 15 or so traditional dishes. Perhaps in an attempt to attract a wider segment of the population, the restaurant also offers a variety of crepes, both sweet and savory, but never particularly Polish. Let’s take a look at the national specialties. 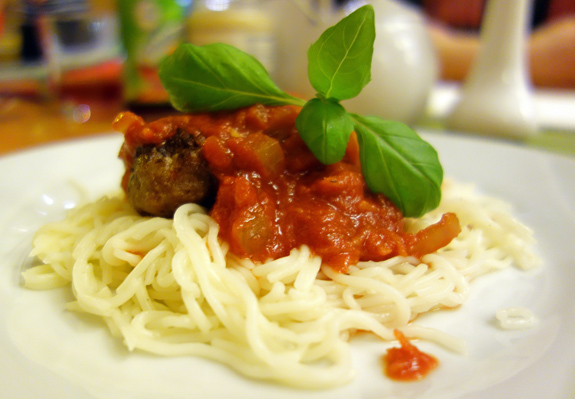 The pulpety were very similar to Italian polpette: beef and pork meatballs (most likely made with 100% meat, and pan-fried), with basil and a chunky tomato sauce, served on top of thin spaghetti. Overall, this dish was satisfying and enjoyed by all. Still in the pasta category, Yellow Bench offers both Polish pierogi and Russian pelmeni, each in several versions: potato-cheese, cabbage-mushroom, or meat. 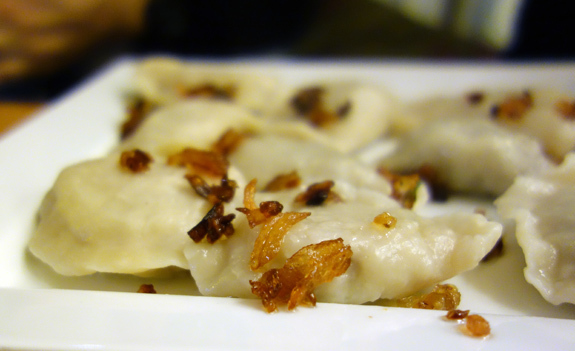 The pork and beef pierogi, topped with fried onion and accompanied with sour cream, contained a very finely minced filling that was a little bit on the mealy side. 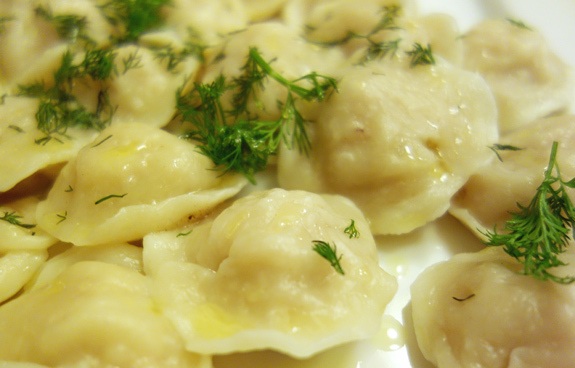 The pork, beef, and lamb pelmeni were tossed in butter and sprinkled with dill, of course, though not excessively. I wouldn’t have been able to blindly identify the three meats, but the filling was airy and quite tasty. The dumplings didn’t have the tortellini shape that’s most common for pelmeni, but that was totally fine — if I were a stickler for the tortellini shape, especially following a polpette appetizer, I’d go to an Italian restaurant. 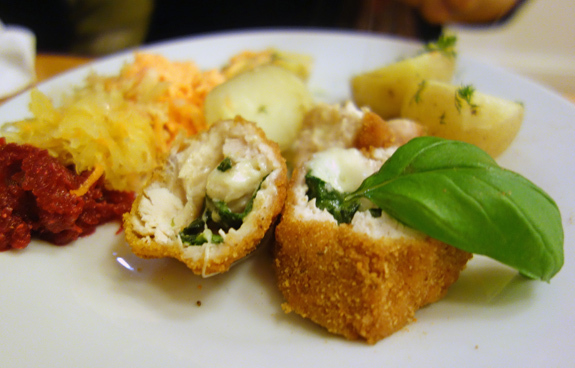 The devolay, a breaded chicken breast stuffed with cheese and spinach, came out quite good. The dish name is rather interesting. I couldn’t find it in any of my cookbooks, and the word doesn’t seem to mean anything in Polish either. 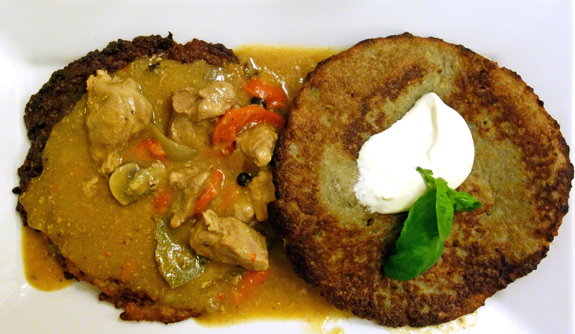 It turns out it comes from the French de volaille, and is short for cotelette de volaille, meaning poultry cutlet. 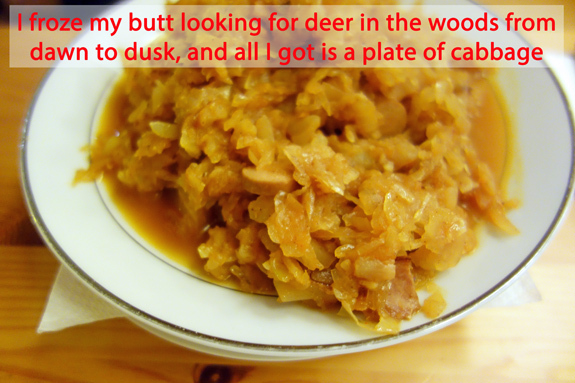 The bigos was a bit of a letdown; it was basically a pile of sauerkraut with tiny pieces of meat and cheap knackwurst. If I was a Polish hunter and I was served that after a day in the woods, I’d probably grab my shotgun and make the cook run in a zigzag across the yard. In fact, there’s something seriously wrong about some of the versions of bigos that I’ve been served in various restaurants. I’ve seen traditional recipes with ingredient lists longer than my arm (one of them with 8 different kinds of meat), yet here we are, paying for three ingredients heaped on a plate. I suspect communist food shortages had a hand in this contemporary oversimplification, but now that capitalism has won out, it’s high time to revert the process. If we are to believe Google Translate, placek zboja means “bandit’s pancake”. The dish was described on the menu as “pirate’s delight”, which is at least in the gist ballpark. I found the pancakes a bit heavy, and I could have done with just one rather than two. The pork stew with mushrooms and peppers was fine but nothing special. 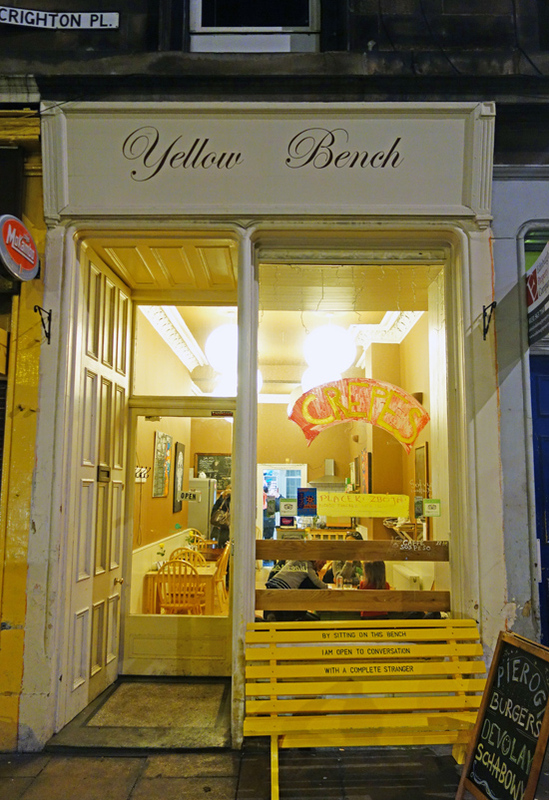 Yellow Bench doesn’t serve alcohol, but they carry some authentic Polish fruit juices such as the apple-cherry Tymbark below, which was good though on the sweeter side. 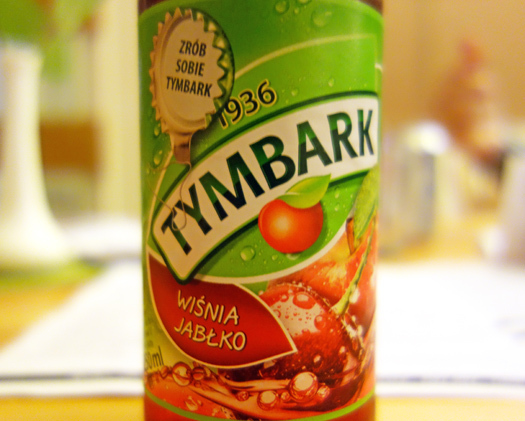 Reading their beverage list, I also noticed that Polish is the only language I’m aware of in which the word for tea, herbata, has a completely different etymology (everyone else’s usage comes from the Chinese te / chá). Not everything’s great at Yellow Bench, but if you know what to order, you can have a good rustic meal. If Edinburghers don’t like it, they don’t have too many alternatives. 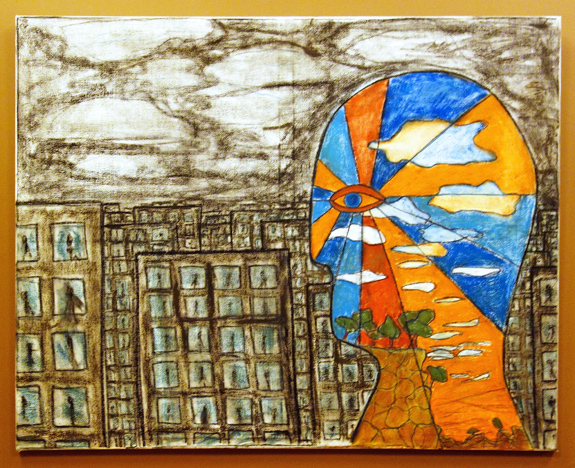 It’s this place, or a round trip ticket to Poland.